Within the mechanical processing technology sector, POWTECH is the largest and most international sector platform worldwide for processes used in the manufacture of quality products from powder, granules, bulk solids and liquids. From fine nano particles to coarse stoneware – this is the only event to show the special features of bulk solids handling in their entirety. Here you reach process technicians and engineers, bulk materials experts, production managers, scientists as well as process and project engineers. Continuous agglomeration of food ingredients already starts after 12 days At Powtech 2019 in Nuremberg, the plant manufacturing and process development specialist, Glatt, is presenting new plant concept for continuous powder agglomeration: it’s extremely economical, versatile and, thanks to its modular design, is ready for operation in 2 weeks. With this compact modular system, Glatt is responding to manufacturers who want to upgrade or renew their machinery at short notice, with limited space and with production volumes of 100–3000 kg/h. Designed to meet market requirements, the Atex-compliant concept, equipped with WIP cleaning, also scores with an extremely short installation time of only 12 days and an integrated room and zone concept. Powder synthesis by spray calcination with APPtec® now also available in lab scale Another highlight at Powtech 2019 in Nuremberg presented by Glatt, the plant manufacturing and process development specialist, is the continuous powder synthesis method: APPtec®. Using spray calcination in a pulsating hot gas stream at temperatures of 200-900 °C, powders with particularly narrow particle size distributions can be produced from a wide range of starting materials. The unique and easily controllable thermodynamic process conditions make it possible to precisely adjust the product properties — for example with regard to chemical composition, morphology, phase structure and coating or surface chemistry. In addition to the joint development of APPtec®-based powders and contract production, Glatt also offers reactors of the ProAPP® series in various sizes — such as for laboratory scale production. Powtech 2019 hall 4, stand 186 Vortex will display several products at Powtech 2019, Hall 4, Stand 186, 26-28 September, in Nürnberg, Germany. Vortex’s Titan Series slide gates and diverters are valves engineered for heavy duty material handling applications that pose additional abrasion or wear issues to the valve. Some of the materials handled with Vortex Titan valves include alumina, bauxite, cement, clinker, coal, fly ash, frac sand, gravel, glass cullet, lime, limestone, metal powders, potash and sand. The Titan TLD Diverter offers replaceable wear liners for added abrasion resistance and removable access panels for internal inspection, cleaning or maintenance. The Titan TSG Gate handles dry material in gravity flow applications where positive material shut-off and dust tight sealing is required. Vortex’s Aggregate Diverter has optional inlets, chute liners, and bucket liners that extend the life of the valve when handling abrasive materials. FLOWMETER FOR BULK SOLID PRODUCTS The Master BulkSlide from Rice Lake Weighing Systems is a bulk solids flow meter with an accuracy of ± 0,5 percent. It calculates flow vertically by measuring the center point flying force of materials as they move through the BulkSlide. The Master BulkSlide can be used to measure most free-flowing, non-sticky bulk solid products. It has a simple, compact design allowing it to easily integrate into existing processes. Some advantages of the Master BulkSlide include: •	Carbon or stainless steel construction •	Energy efficient •	Stable zero point •	Data transfer to PLC or PC The Master BulkSlide is a low maintenance system ideal for most environments. MOLOSroto – unbelievable but real! MOLOSroto level indicators monitor the filling level at 100 bar and in explosive areas The rotary blade level indicator with zone separating element MOLOSroto DF23A3 … ZTP7 monitors the filling level of bulk goods even under extreme process conditions. This device is used in a settling pit of a gas pipeline. There is ATEX zone 0, the most dangerous explosive atmosphere as a mixture of air and flammable gases. Furthermore, the device has to resist a pressure up to 100 bar. Not only this high-end-device, but also standard rotary paddle switches of the MOLOSroto series are an optimal solution for the monitoring of levels and processes in nearly any kind of application in the areas of loading, storage, processing and transportation. Sediments in a settling pit of a gas pipeline can be reliably measured as well as filling levels in a grain silo or of finest powders in the chemical industry. LUM supports NanoCarbon Conference 2019 For the 5th time the Network NanoCarbon would like to invite you to the Annual Conference in Würzburg, Germany, from 26-27 February 2019. The event offers an open forum to the nanocarbon community for exchanging results and ideas. It is the most important communication platform for innovative and commercial activities in the field of carbon nanomaterials (e.g. CNTs, graphenes and nano-diamond) within Germany and beyond . 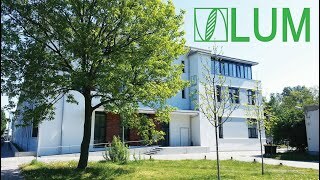 The product portfolio of Berlin based LUM GmbH provides innovative analytical instruments for the characterization of the entire life cycle of carbon materials, for carbon black and graphene, nano-diamonds, Carbon nanotubes and Carbon onions. For the quality control of raw materials, on the basis of their particle size distributions, the Dispersion Analyser LUMiSizer is used for nanoparticles. For the characterization of dispersibility and separation stability or shelf life the user needs to know the product properties in its original concentration. Fast and reliable switch off for the loading process of trucks and ships! The rotary paddle switches of the MOLOSroto series are the ideal solution for the control of levels and processes in the areas of loading, storage, processing and transportation. Plastics granular, wood pellets, or fine powders of the pharmaceutical industry can be reliably measured as well as sand and coarse gravel for the building material industry. The MOLOSroto DF30 combines a shortened blade shaft, a special designed blade and a higher blade speed. Of course, all relevant ATEX approvals are available as well. Consequently, it fits perfect for the use in loading bellows. It needs few space and provides an absolute reliable signal as soon as the truck or ship is fully loaded or the next loading point has to be approached!